Almost exactly a year ago people were saying that LeBron should be Finals MVP no matter how his Cavs did against the Warriors (they ended up losing in 6), and with his stellar play this year it seems that people are going right back to that point of debate. I don’t really want to get into that debate, as debating the meaning of the word ‘valuable’ isn’t something that interests me in the least. Rather, I want to focus on how good LeBron has been and put it in a historical context. The only Finals he was in where he wasn’t the best player was his first one, where teammate Dwayne Wade lead the way with a 22.7, and LeBron had a ‘lowly’ 13.7 (third overall, behind Dwayne and Dirk, who had a 16.6). Needless to say, being the best player in five straight Finals has never happened since 1985, when the stat is available. The other GOAT, Michael Jordan, was the best player by box score in 5 of his 6 Finals appearances – winning all six Finals and all six Finals MVPs. What’s even more shocking to me about the whole situation is that LeBron is by far the best player in the series… and they might lose. Basketball, more than any other major American sport, is a game where an individual can carry his team, so if one player is extremely better than everyone else, you would expect his team to win. This usually holds true when you look at history. 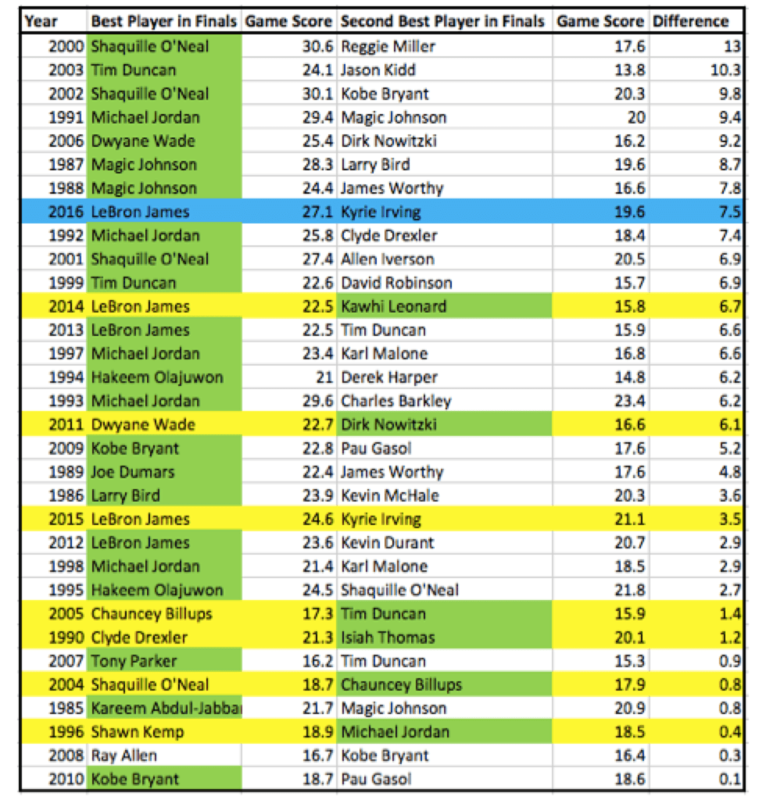 For every Finals since 1985 I calculated the difference in game score between the best and second best player, and then created the below table, sorted by the difference between the best and second best. I highlighted the Finals MVP in green and the whole row in yellow if the best player in the Finals ended up losing the series. This year’s entry is in blue. If the Cavs lose, it would be the most egregious example of the best player in the Finals losing the series. If the Cavs lose, the four most egregious examples of the best player in the Finals losing the series would be LeBron (3 times) and then Dwayne Wade… when LeBron was on his team. If the Cavs lose game seven and LeBron and Kyrie finish with the two highest game scores, it would only be the second time since 1985 that the top two players in the Finals were on the losing team, however, the first occurrence was last year when Kyrie only played one game, so that shouldn’t really count. No player has lost the Finals while being the best player in the Finals multiple times… except LeBron, for whom it would be his third time should they lose tonight. Shaq really did carry Kobe in the early 2000s. 2007 was his first finals.